Product #16300 | SKU MEADSD02 | 0.0 (no ratings yet) Thanks for your rating! The MEAD-SD02 SDHC/SDXC Card Adapter from Sony enables the use of a Class 10 SDHC/SDXC memory card, including UHS-1, in the ExpressCard slot of XDCAM EX equipment, such as camcorders and recording decks. It will also work with other ExpressCard compatible hardware, such as Windows and Mac computers and storage drives. 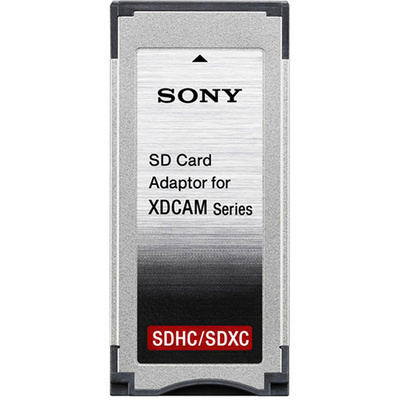 Although the SxS PRO and SxS-1 cards intended for the memory slots in XDCAM models offer higher performance, SDHC and SDXC cards are more readily available in a pinch when additional memory is required. This adapter, which is the same size as an SxS memory card, provides a viable solution in this type of situation. Please note that use of the slow motion recording function is not recommended, due to the speed limitations of SD cards. XDCAM EX hardware may require a firmware upgrade in order to support the use of the adapter.